Last year I had the opportunity to travel to Hyderabad and witness the temple rituals performed in the Sri Ranganathaswamy Temple during its Brahmotsav celebrations. The experience was a very special and unique one because this is the only temple where dance is performed as part of worship today. In the following article I tell the story of how dancer Swapnasundari was able to reinstate and perform the ritual dances of Vilasini Natyam in this small temple on the outskirts of Hyderabad. Many of India’s classical dance traditions originated in the temples, where dance was presented as a sacred ritual offering to the deity. Eventually Indian classical dance moved from these sacred spaces to performance venues, where it is performed today as entertainment to large audiences. Meanwhile, the temple has become a popular scenic backdrop for dance festivals like Khajuraho, Chidambaram and Mukteshwar. But in a small, scenic temple in Rang Bagh on the outskirts of Hyderabad, in India’s southern state of Andhra Pradesh, the ritual and ceremonial dances which were once performed by temple dancers known as saanis or bhogams have been revived and reintroduced as a part of worship during the temple’s annual Brahmotsav celebrations. 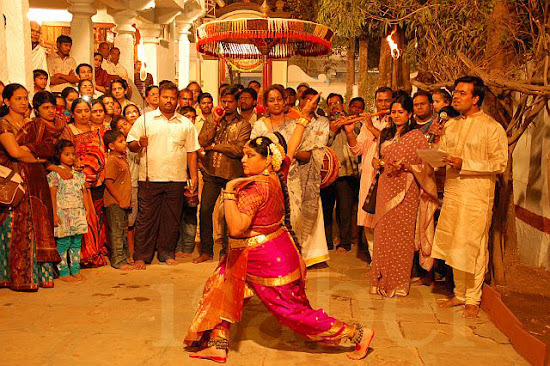 These dance rituals have been restored by the temple authorities through the active collaboration of renowned dancer Swapnasundari, who after making a name for herself as a Bharatanatyam and Kuchipudi dancer, dedicated herself to learning and reviving the dance of the Telugu-speaking regions, which is known today as Vilasini Natyam. For Swapnasundari, this opportunity must have seemed like a gift from the gods: “I was eagerly waiting to dance the rituals in their original setting and context,” she said, “rather like a professor of chemistry waiting to find the appropriate laboratory where his or her wonderful formula could be applied in practice! 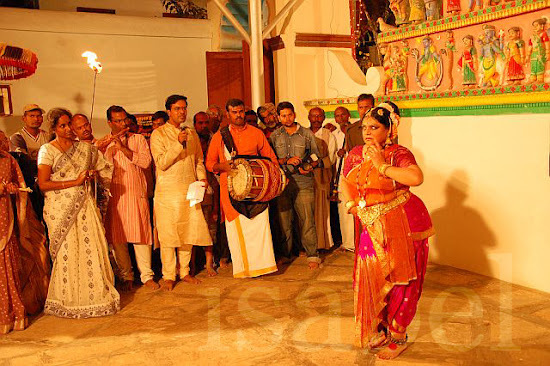 But no temple came forward before the Rang Bagh trustees did.” This opportunity to reinstate and perform the ritual dances of Vilasini Natyam in a temple setting seemed serendipitous and almost a natural result of her efforts to research, document and teach this dance which was once in danger of being forgotten. What followed was a long process of research and investigation to piece together the rituals in order to be able to reproduce them as authentically as possible. Mr Pitti described the process: “We looked through ancient texts and heard there was a man who had a few books on these rituals. We managed to contact him and he let us photocopy them. They were in Sanskrit and Telugu. Swapnasundari worked very closely with the temple priests to identify and recreate these rituals. What we have now is a refined and filtered version which is the result of a long process.” With great effort, Swapnasundari even managed to contact the daughter of a temple dancer who had been consecrated to this temple. It took much pleading and insistence but she eventually agreed to come to the temple and show Swapnasundari the rituals her mother used to perform. Using these references and inputs, Swapnasundari was able to identify the dance rituals which were once performed by the temple dancers of Sri Ranganathaswamy temple. These were first reintroduced in 1996 during the temple’s Brahmotsav celebrations, choreographed and performed by Swapnasundari. Today, she and her disciples take turns performing the ritual dances during the eight days of the annual festival which usually falls in February (see below for the 2013 dates). The first daily ritual is the Balabhogam when the first food offering of the day is made to the deity. 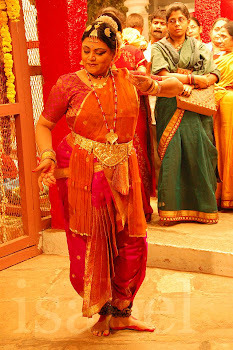 The temple dancer invokes the deity with a hymn called Choornika followed by a Pallavi, an item of Nritta, or pure dance. At 11am and 8:30pm, before the temple idols leave the temple on a palanquin, Baliharanam is performed, followed by the Pallaki seva when they are taken outside the temple, and the Kumbha Arathi and Heccharika on their return. During Baliharanam, the Ashta Dikpaalakas, the guardian deities of the eight directions, are invoked in a ritual where each deity is asked in turn to provide protection in preparation for the journey outside the temple. After invocations to Brahma and Garuda, the priests, dancers and musicians move in a clockwise direction around the temple, pausing at each of the eight points which are clearly marked by small raised platforms. Starting to the east, Indra is the first guardian-deity to be invoked followed by Agni, Yama, Nirrti, Varuna, Vayu, Kubera and Isana. At each of the eight points, the priests chant prayers in sing-song unison, followed by a loud rhythmical introduction of the Tavil and the Nattuvangam before the singer and flutist join in and the dance begins. Swapnasundari has reclaimed all the obsolete Talas related to this ritual and re-incorporated these into the chorography of this ritual. With the invocations to the Ashta Dikpaalakas complete and their protection of the temple ensured, the palanquin moves out of the temple compound in a procession. The procession stops on the way, so that devotees can offer their prayers and offerings. At each halt, the dancer dances to a verse of a devotional hymn. By the time the procession completes its journey, an entire song or set of songs would have been completed. This ritual is called Pallaki Seva. Before re-entering the temple, the palanquin stops just outside the main doorway for the Kumbha-harathi. The temple priest lights a lamp which is placed in a pot. Accompanied to the music of a Mallari, the dancer takes the pot and performs Arati before the deity and then walks around the palanquin. This is an act of purification before it re-enters the temple. This is followed by the singing of a Heccharika. Through mimed movements, the dancer requests the deities to re-enter the temple with caution as ‘undesirable elements’ may have entered the temple in their absence. At the same time she warns these negative elements to leave the temple premises. These are the three rituals performed daily. During the Abhisekam (sacred bathing) and Kalyanam (wedding ceremony) of Sri Ranganathaswamy and Maha Lakshmi, other dances are also performed. This article was published in the September 2012 issue of Avantika magazine. This year, Sri Ranganathaswamy Temple celebrates its Brahmotsavam from February 17 to 24, 2013. The dance rituals take place every morning and evening until February 22nd. In 2014, the Brahmotsavam will take place from February 7 to 11.